Is your current skincare routine upsetting the balance of your skin? After cleansing, your skin should never feel stripped or dry! With so many skincare products on the market it can be hard to find a good natural facial cleanser that actually does the trick! Is your skin dry or dehydrated? Oily or acne prone? What if I told you that each of these problems could be solved by simply cleansing your face with oils. Oil cleansing may sound strange but it’s actually the perfect method to restore balance back to your skin! Over washing of the skin is a huge problem, particularly if you have oily skin. You may think that by scrubbing all of the oils from your face, you are thoroughly cleansing. However, what you are actually doing is forcing the skin to produce even more oils to compensate, which can cause breakouts and dry patches! That’s where oil cleansing comes in. Oil cleansing works on the principle that oil dissolves oil. 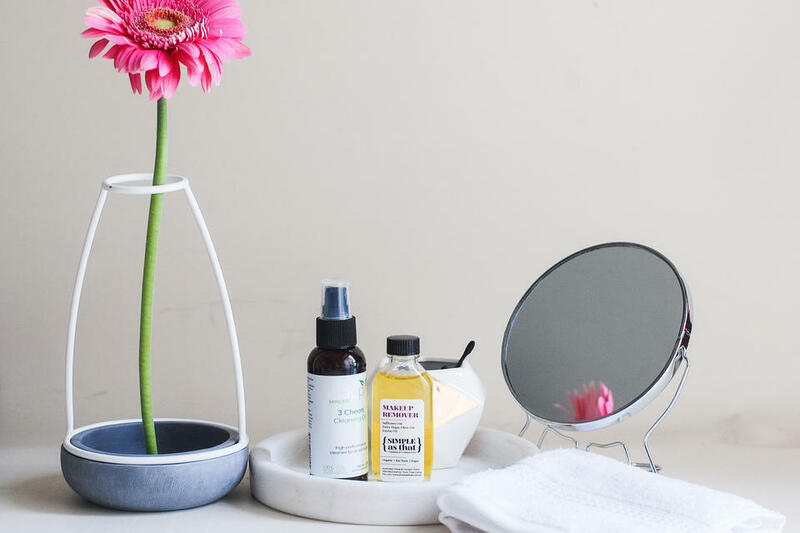 When cleansing oils are massaged into the skin, the ‘good’ oils work to dissolve any ‘bad’ oils that build up on the skin’s surface and cause problems. These oily impurities include dirt, grime, makeup and oxidised sebum (which cause blackheads).1 The oil cleanser binds to these impurities, which are then drawn out and washed away with water.2 When cleansing oils are mixed with water, they turn into a milky emulsifier.1 The result? Clean skin that is soft and moisturised. What are the benefits of oil cleansing? How do oil cleansers differ from micellar waters? Micellar water works in a similar way to cleansing oils, although they are water based. The word micellar takes its name from micelles, which are the tiny molecules (surfactants) that float in the water. Micelles have an end that’s attracted to water (hydrophilic) and an end that’s attracted to oils (lipophilic).4 These molecules are able to combine water and oil without repelling against each other. Like oil cleansing, micellar water draws out impurities to remove oily build up on the skin. Micellar water is typically applied to a cotton pad and wiped over the face. Which natural oil cleansers do I recommend? This amazing oil cleanser from Happy Skincare is formulated with a long list of essential oils with great skin benefits. These include highly moisturising Jojoba Oil, soothing Macadamia Seed Oil and antibacterial Lemon Myrtle Oil.3 This cleanser also smells lemony fresh and is so easy to use! Simply apply 4-5 pumps onto dry skin, massage onto the face and then dampen. Once water is added, the facial oil will turn into a milky consistency. To rinse off, use a sponge or flannel, making sure that every last bit is removed. You don’t want to leave any dirty oil on the skin! This facial cleansing oil from Black Chicken contains 14 pure medicinal oils that work to cleanse, balance and nourish your skin! Ideal for acne prone skin, this cleansing oil contains Sweet Almond Oil to soothe damaged skin and Patchouli Oil to reduce the appearance of acne scarring.3 To use this cleanser, add 1-2 pumps onto dry skin before wiping away with a damp cloth. 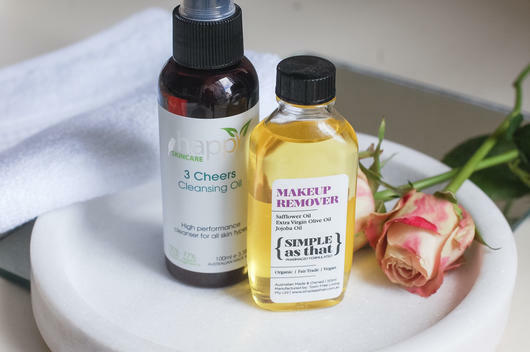 To remove stubborn eye makeup without irritating your eyes, I recommend using this oil based makeup remover from Simple As That. Gentle enough to be used all over the face, this product is 100% natural and full of essential oils like Jojoba and Sunflower oils. It’s also rich in antioxidants, Omegas 6 and 9, fatty acids and Vitamins A, D and E. This highly nourishing makeup remover works best when applied to a cotton pad and then wiped over the face and eye area. 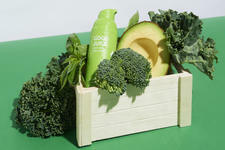 I absolutely love this kit from MOA because it comes with a green cleansing balm and bamboo wash cloth. Everything you need in one affordable pack! This cleansing balm is formulated with a deeply purifying combination of oils including Tea Tree and Coconut Oil. Packaged in a luxurious glass jar to retain the nutrients inside, this balm helps achieve balanced, soft skin. To use this balm, melt a small amount between your fingers to create an oil, before massaging into the skin. To wash off, wet the bamboo cloth in warm water and press it to your face. Then rinse it in cold water and use the soft side to press against your face.